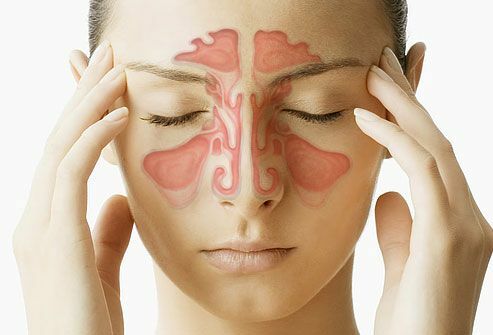 Sinusitis-rhinitis are conditions which affect the nose. Rhinitis is inflammation of the nasal mucous membrane, and it tends to be divided into two kinds – allergic rhinitis and non-allergic rhinitis. The symptoms of this inflammation are usually sneezing, congestion and a runny or itchy nose. In allergic rhinitis the attacks are usually clustered around an event, exposure or a time of year – although some people do suffer from non-seasonal or non-specific attacks, which can be quite stressful and debilitating, especially since if you cannot find a cause you will not be able to avoid the triggers. Allergic rhinitis is caused when the body’s immune system responds in an excessive way to pollen, animal hair, dust or other common allergens. The most common treatment for this kind of issue is to take antihistamines, which will block that part of the immune response. Non-allergic rhinitis, on the other hand, involves inflammation or blockages that are not part of an immune response. Sometimes, it is caused by over-use of decongestants, sometimes it is a sign of an infection, and in other cases it is caused by a deviated septum. Sinusitis is inflammation of the sinus cavities. This can sometimes be linked to rhinitis, but in other cases it can be caused by infections or allergies. Taking anti-inflammatories and decongestants might help with sinusitis, and will help to alleviate the other peripheral symptoms such as headaches, but if the attacks are frequent then it is a good idea to look for a longer-lasting solution. In cases of chronic sinusitis/rhinitis, treatment options can be limited. Taking decongestants and antihistamines to treat sinusitis/rhinitis can offer short term relief, but over-use of these can have its own side effects. It makes sense to go to the doctor to get checked for polyps, allergies, and anything else that could cause a sudden change in your health and sinus problems. There are some types of sinusitis and rhinitis that respond well to acupuncture, but there are others where surgical intervention or other medications may be required. The defensive energy in the body that is supposed to protect it from infection is something that the Chinese have a good understanding of. If the defensive energy is not working in the way that it should, then that could manifest itself in the form of pain, inflammation and irritation of the nose. One thing that a traditional Chinese medicine practitioner might do to help treat rhinitis or sinusitis is try to restore the flow of energy and Blood for the body’s defensive system. They may not target the nose, specifically, but they could look at other things which are affecting the body as a whole system. Did you know, for example, that your diet can affect your mucus membranes? If you are taking too much dairy in your diet, then that could actually lead to congestion. A good acupuncture therapist will do far more than just stick needles into your skin. They will take the time to get to know you and understand your needs, and they will give you advice based on those needs. They will look at your lifestyle and diet, and they will give you a treatment program that will help with your overall wellbeing. Sometimes, traditional medicine is not enough. Surgery may be a requirement for chronic sinus pain. However, before you commit to this it makes sense to try less invasive treatments. It could be that you will find a way to alleviate your symptoms without depending on drugs, or going through a surgery that while usually successful, requires some rather painful healing time.